Step Into Action Dr. Riley Senft's personal quest to save the lives of future prostate cancer victims. Update - July 2018. We're pleased to announce that Riley's book is now available! Follow the link below to get your copy. "The Step Into Action run was not only a significant experience for me; it also impacted many of other lives. With this book, I wanted to create a record of the event for those who participated in or contributed to the success we all shared. This book acknowledges all those who helped make Step Into Action a reality. This book also serves as a record for myself, and as a gift to my children, so they can see what their dad was up to that summer of 2011." October 2016. As the five year anniversary of the completion of Step Into Action approaches we are delighted to announce that WE HAVE REACHED OUR GOAL, having now raised $1,088,917 for the Vancouver Prostate Centre! We look forward to celebrating with you at our anniversary party on Oct 6th. November 18, 2015. HAPPY MOVEMBER!!! With the 5 year anniversary of Riley's cross-Canada run approaching, we are working on a number of initiatives to push towards our Million Dollar fundraising goal. More to come as the SIA team continues to brainstorm and find the right way to properly celebrate the anniversary and gather further fundraising momentum. We are pleased to announce a relationship with 2UNDR a performance men's underwear company, founded in Vancouver, BC. The team at 2UNDR has released a BLUE RIBBON colorway and is encouraging men to "Join the UNDERWEARNESS movement" with a portion of proceeds from each pair of Prostate Cancer Blue 2UNDR's in Canada donated to Step Into Action. August 20, 2014 Step Into Action continues in it's quest to raise money and awareness. Through recent fundraisers including the Mr Lube Golf Tournament SIA has raised $837,738 towards it's goal of $1,000,000! 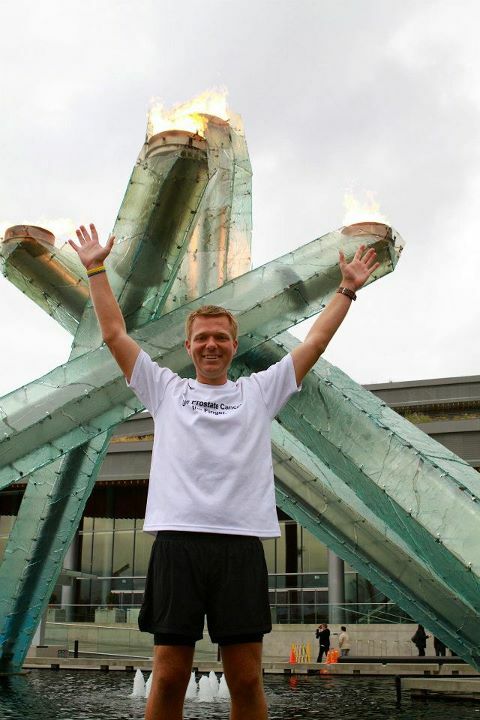 October 7, 2012 This marks the one year anniversary of Dr. Riley Senft completing his coast to coast run across Canada to spread the word that early detection of Prostate Cancer can save lives. So the question is: Men ... have you followed the STEPS TO ACTION and seen your doctor to get checked for Prostate Cancer? Depending on your situation and family history a DRE and PSA test could quite simply, save your life. Follow the steps to action, book an appointment with your doctor and ensure you (or the men in your life) don't die of embarassment. Early detection is the key! Update: Riley took a trip across the pond to share the Step Into Action message with the men and women of the London Business School as a distinguished speaker at their TedX event. Take a look at the video to remember the grizzly truth about prostate cancer and the incredible journey Riley embarked on to make a difference. And a difference has been made - $571K raised. Know the steps to action and commit to early detection! Welcome to Step into Action, Dr. Riley Senft’s personal quest to save the lives of future Prostate Cancer victims by educating men on the steps to early Prostate Cancer detection. 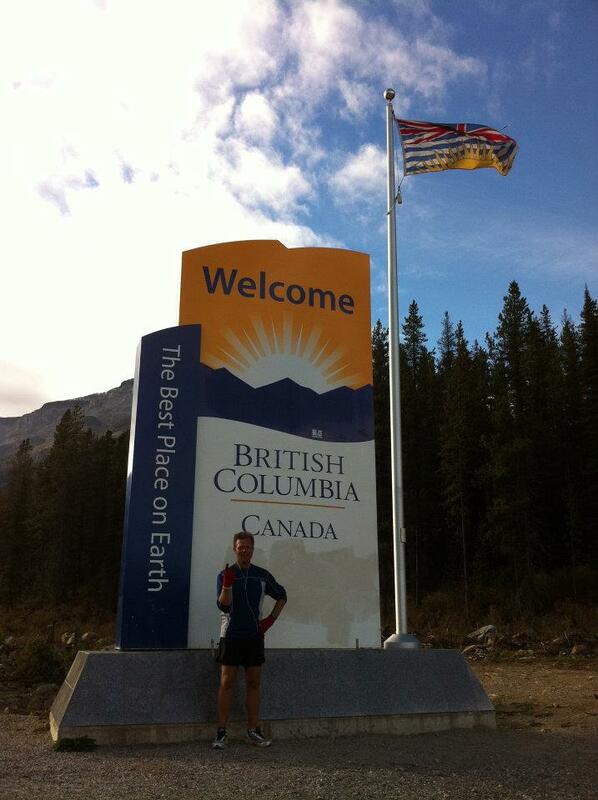 On May 7, 2011, from Mile Zero in Cape Spear, NL, Riley will run nearly 60km each day across the country, finishing in Vancouver, British Columbia in October of 2011. Commit to knowing the Steps to Action. Remember, one finger can save your life! Download the Steps to Action PDF to email and share! Click the button to the left, to show your commitment to the critical Steps to Action for early Prostate Cancer detection. Caught in the stage one, Prostate Cancer treatment options offer a greater than 90% success rate and the least invasive procedures. 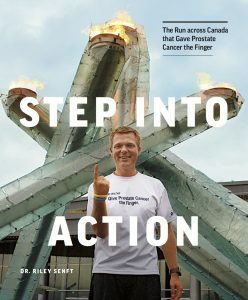 In addition to educating on the steps to early detection, Step into Action is partnered with the VGH & UBC Hospital Foundation, a registered charity, raising funds in support of the Vancouver Prostate Centre, a National Centre of Excellence and world renowned research and treatment centre. Donate now! © 2019 Step Into Action. All Rights Reserved.